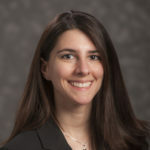 April M. Zeoli, Associate Professor of Criminal Justice at Michigan State University, is an expert in public health and criminology, the role of firearms in intimate partner violence and homicide. Zeoli is the primary investigator on research to analyze the strength of legal firearm restrictions for perpetrators of domestic violence and their impact on intimate partner homicide as well as the implementation of domestic violence firearm laws in selected communities. She has been recognized for her research that applies an infectious disease model to the spread of homicide in Newark, New Jersey and has consulted with the Battered Women’s Justice Project. She has been published in numerous academic journals, including the American Journal of Public Health, Epidemiologic Reviews, Justice Quarterly and Journal of Family Violence. Zeoli received her Ph.D. in Health and Public Policy from Johns Hopkins Bloomberg School of Public Health, M.P.H. in Reproductive and Women’s Health from the University of Michigan and B.A. in Women’s Studies from the University of Michigan.